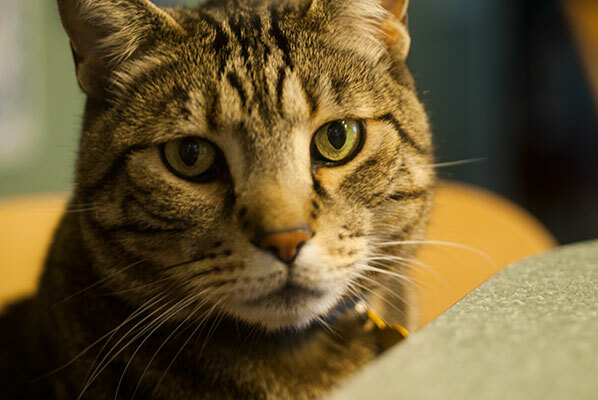 But, since they did manage to get me up at a dark 6:45am, once I had fed and watered them, and given them their required stroking attention, it seemed fruitless to go back to bed, only to have them meowing at the door in indignation. Instead, I turn on the radio and make myself a cup of tea. It is only when the mellow tones of the weekend CBC radio morning show host remind listeners that it is the first day of December that I remember – the Advent Calendar! 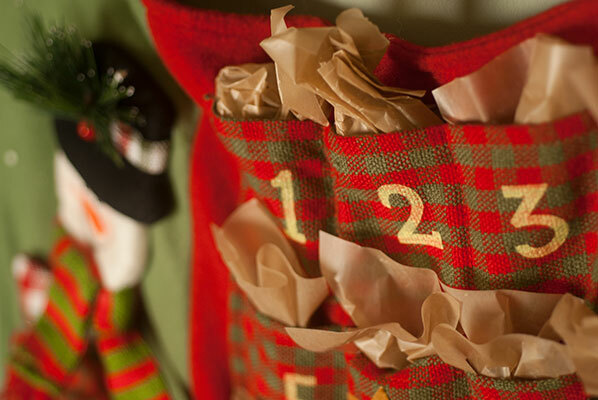 I made my way to the front hallway closet and opened the sliding door very cautiously, to retrieve the cloth Advent Calendar I know I put in that closet at the end of December, last year. Most people’s front hallway closets, I suspect, do not pose quite as much of a health and safety risk as does ours. We tend to cram as much “necessary but seasonal” stuff into it as possible, including snowboarding gear, the cat’s carrier, a sponge rubber replica of a chocolate layer cake (a really excellent prop I made for a show), vampire capes, Roman helmets, and many coats and rain pants. Cleaning it out is a project for the New Year, which I cannot possibly think about now. Now is the time for the beginning of Yuletide festivities, which, in my opinion can only decently be noticed and begun as of December 1st – the first door or pocket of the Advent Calendar. 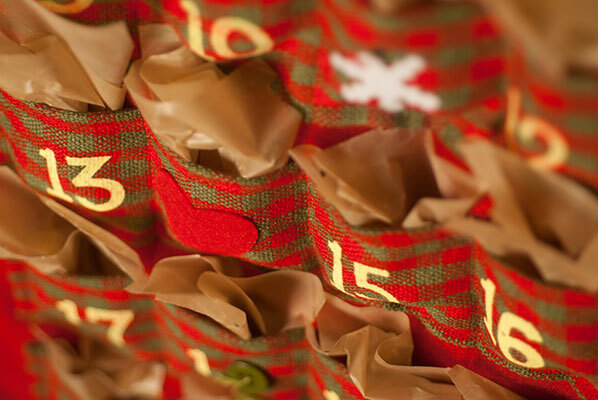 When I was growing up, my Mum didn’t really do the advent calendar thing, but my best friend’s Mum was another story. The So family’s whole kitchen became the best advent calendar I ever saw, as her Mum laid out the Treat Table, which would remain in effect until Christmas. The treat Table was loaded with jars of candied citrus peel, mint patties, chocolates, gingerbread, butter tarts and tiny cookies. We were allowed one treat per day (Mrs. So is that delightful combination of generosity and a strict sense of what is good for children), and it was always soooo hard to decide which of the aromatic, delicious goodies to sink our teeth into – but that was part of the fun. I am not in the same league as my best friend’s Mum. It takes everything I’ve got to haul out that bright felt rectangle covered with happy snowmen and individually numbered pockets, and get it up on our kitchen wall. I bought it a few years ago at a crafts sale, thinking it much homier and environmentally sound than the cardboard and plastic kind, and now every year I have the enjoyable task of finding appropriate chocolate to fill it. Which is easy for an organized person who doesn’t forget to fill it. And since taking the Ecole Chocolat course, it has become a wee bit more challenging, as I just can’t bring myself to put bargain chocolate in the pockets. Nor can I afford to break the bank, buying exquisite little had wrapped pieces from a really good chocolatier. ‘The origins of the Advent calendar come from German Lutherans who, at least as early as the beginning of the 19th century, would count down the first 24 days of December physically. Often this meant simply drawing a chalk line on the door each day, beginning on December 1. Some families had more elaborate means of marking the days, such as lighting a new candle… each day. The 24 candles might also be placed on a structure, which was known as an “Advent clock”. In December 1839, the first verifiable public Advent wreath was hung in the prayer hall of the Rauhes Haus (relief house) in Hamburg, although it had been a family practice in parts of German-speaking Europe since the 17th century. 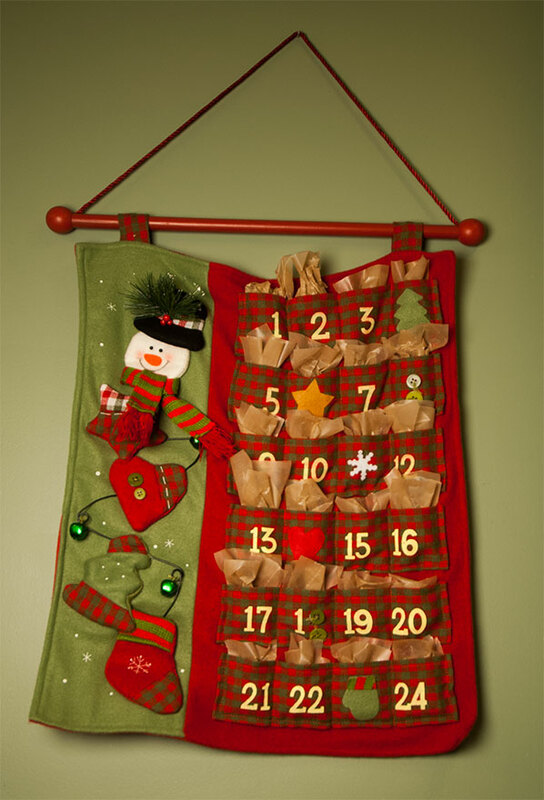 The first known Advent calendar was handmade in 1851…. produced in Hamburg in 1902 or 1903. Gerhard Lang was a printer in the firm Reichhold & Lang of Munich who, in 1908, made 24 little colored pictures that could be affixed to a piece of cardboard. Several years later, he introduced a calendar with 24 little doors. He created and marketed at least 30 designs before his firm went out of business in the 1930s. In this same time period, Sankt Johannis Printing Company started producing religious Advent calendars, with Bible verses instead of pictures behind the doors. One of the boys is a milk chocolate lover, the other prefers a good dark. I open the wrappings and a small piece, from a previous project rolls into my hand. I gaze at it. And I set to work. Carefully hacking off 24 small “lumps of coal” from each of the milk chocolate and dark chocolate slabs, I wrap them each in a slip of waxed paper and stuff them into the pockets of the cloth advent calendar. And then I make myself a cup of tea, and snuggle farther in to my bathrobe. Just bought myself another hour. And an hour later, when they wake up (they are teenagers after all and it is the weekend), I make them pancakes and relax and have a chat with them: my “almost grown to men” sons. And I wait for them to spot the Advent Calendar hanging on the wall. And when they do, their eyes crinkle up and they dive into it, as though they were still six and four years old. And they love the lumps. And I love that these very big, very grown up guys still occasionally have chocolate smears on their faces. And I am launched into the Yuletide season once again, with the gentle reminder that neither me nor my family will ever be the Waltons, or even particularly well organized, but that is okay, and is a good thing to remember in the craziness of the weeks leading up to Christmas.